Sold by Koopon and Fulfilled by Amazon. Gift-wrap available. 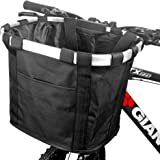 Amazon's Choice for "front bike basket"
REMOVABLE & FOLDABLE - This multifunctional bicycle basket attaches via a quick-release handlebar mount, making removal a snap. 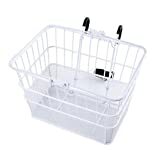 Remove the basket, and carry food or other stuffs for a day of sun, surf, and relaxation. 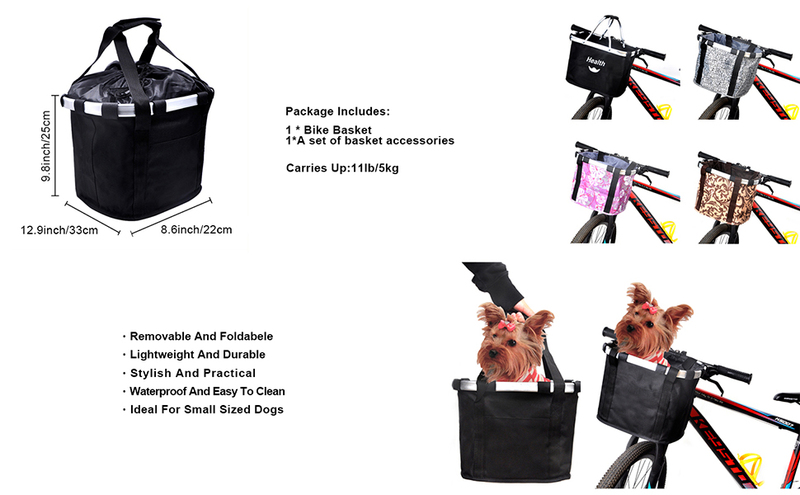 As a pet bike carrier, you can hit the road along with your dog. LIGHTWEIGHT & DURABLE – This handlebar cycling bag are all about convenience. Made of a sturdy metal frame, with a solid oxford fabric, a modern quick release handlebar adapter. The bike basket lives up to the quality craftsmanship. 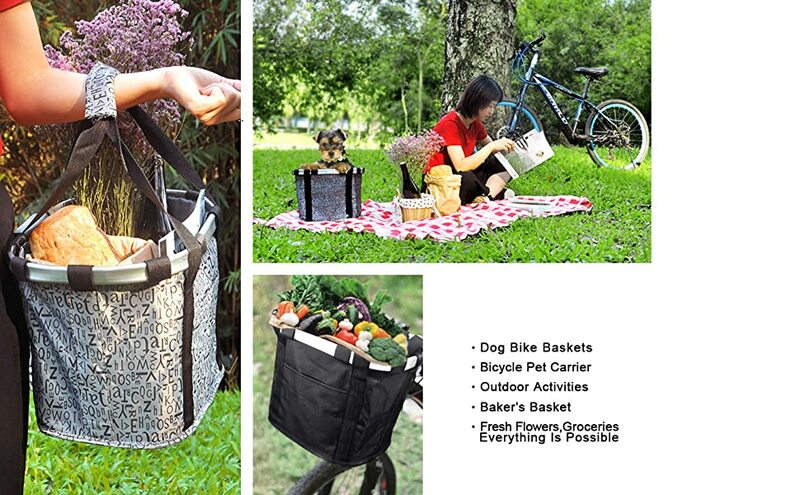 STYLISH & PRACTICAL - Our bicycle baskets are not just stylish, but also incredibly practical. Whether you shop daily at the market, or commute into work by bike, our bicycle front baskets are on hand to make your journey go that little bit easier. 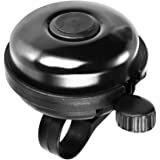 WATERPROOF & EASY TO CLEAN – Would you like the freedom to be able to leave your bike outside without worry? 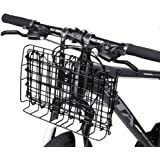 Our bicycle handlebar basket range can be left in drizzly conditions with no worries whatsoever. If it get dirty, just rinse it with water and dry it. 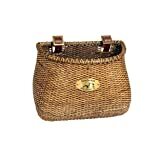 IDEAL FOR SMALL SIZED DOGS - Holds pets up to 11 pounds. 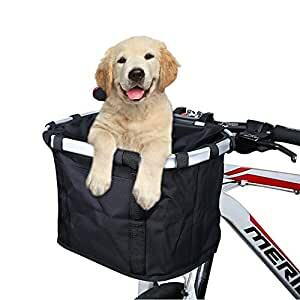 When you use it as a dog bike basket, it easy to disassemble and reassemble quickly for convenience sake so you can constantly take the bike basket on and off the bike to use it as a pet bed or dog car carrier. Sold by Koopon and ships from Amazon Fulfillment. Sold by Titanker Official and ships from Amazon Fulfillment. Nantucket Bicycle Basket Co. Lightship Collection Adult Bicycle Basket by M	Nantucket Bicycle Basket Co.
ANZOME - Spread the cycling pleasant You’ll find an epic range of baskets for men and women, bike bags and baskets for children, not to mention handy bike baskets for your favorite canine. 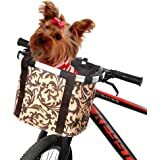 With our dog bike baskets, you can take your four-legged friend with you on your daily errands or trips to see friends and family. With a ANZOME bike basket, you’ll be able to enjoy your bike that little bit more. Enjoy shopping at the market or stocking up at the sales, savor a more serene ride into the office, or get sorted for the school day knowing that your daily essentials are all well stored in your ANZOME bicycle basket. 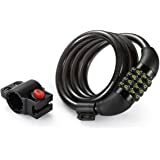 I was frustrated when the item arrived because I found the instructions to attach to bike unclear, but eventually figured it out. The basket is handsome & I get compliments all the time. 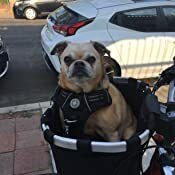 My 14lb pug rides in it every day & no issues. 5.0 out of 5 starsThe same heavy duty connection as baskets costing $100, just not as sharp looking. This is the best dog carrier I have used. I have tried 3 different baskets, two backpack, or frontpack type carriers, and even a trailer!! I personally like the trailer the best, but the dog absolutely hates the trailer. He barks the whole time, and he even jumped out once going 20mph, and the trailer ran him over in the process.. 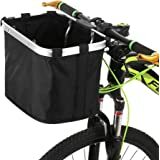 Anyway the basket carriers that cost $100 connect to the bike the same way. Just the basket is not as sharp looking. But for $23 instead of $100 that’s fine with me.. 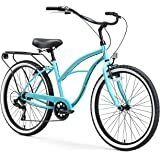 I have an ebike and ride 10-15 miles every day.. He FINALLY ENJOYS riding in something I paid for!! He smiles the entire time. He instantly knew not to stand up when moving. When I stop at a light, he will pop up to reposition himself. He times it perfectly every time.. I have to say he and I both love it!! If it ever gets beat up, I will buy another one exactly like it.. I bought this because I like to ride my bike to the grocery store. Instead of using my backpack to carry items I wanted something that was detachable and easy to install. instructions are ok, but i pretty much figured it out. 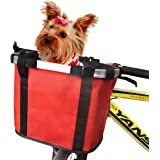 i was able to fit 2 of my dogs in the basket, however I dont think its stable enought to keep them in there, maybe for a light ride. basket is secured with a switch lock on top. zipper pocket inside. 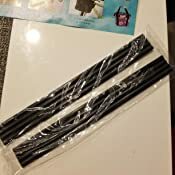 came with 2 plastic strips that instructions does not explain where they go and I still have not figured it out. Overall does the job with carrying items. 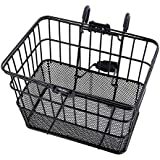 i like that the basket is easily removable and can use it as a shopping bag. I had trouble getting it to fit without making changes to the recommended assembly. My adjustable stem forced me to turn the clamp upside down to get the best angle for the basket. Before I even got to use it, a strong wind blew my bike over and the pocket holding the locking latch broke out. I superglued it back in as there normally isn't any pressure in that direction, but it depressed me to think I had to repair it before I even got to use it. I loosened the the velcro fasteners around the top of the rim and added reflective tape to the metal as there is no where to mount the bike reflector or the existing headlight that would be visible. Hauled a gallon of milk and some small items from the DG to try it out and other than having to readjust to allow for my front shock compression due to bottoming out on the front tire it worked ok. That's when I had to reverse the back clamp to tip the basket up for clearance. The latch is quite temperamental at this point, but I'm not sure if that's due to the fall and break or that's normal. As I said it broke before I even got it put together so if they would like to send me a replacement it would be appreciated but I have about 3 hours assembly time in getting this to work and want to use it and don't want to wait for another right now. 5.0 out of 5 starsGREAT quality!! Thi product is a 5star great piece! My husband and I have lithium battery scooters that we take camping and this works great for when I need to quick run to the corner store for a couple grocery items near the campground. 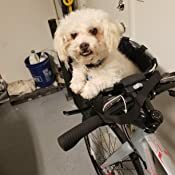 I also have a 10pd yorkie/poodle mix that LOVES to ride in the basket. Keep in mind it has a 10pd weight limit. I love this item!! 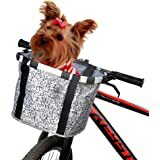 My 5.5lb yorkie loves to ride on the bike with me.I suggest to have a harnes with a clip to put on the basket. I like that the basket locks & unlock so you can take it off. 5.0 out of 5 starsFits my bike perfect. I had to remove it and re-install the base a different way at first, but then I figured it out. 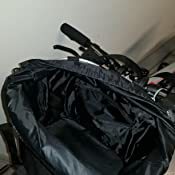 The basket fits perfect on my bike and I can now keep my pump, tools and water with me and have everything ready for use when needed. When I am not riding my bike, I can take the basket off and keep it in my car. First time we put the basket on the bike, it looked nice. Bike tipped over and rim cracked in half. 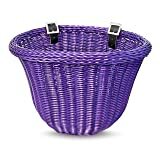 Seller sent replacement without hesitation, new basket working just fine. Glad seller stands behind product. Fabric is quality thick enough to carry a small pet or other items.